Regional US mobile carrier Cricket now belongs to AT&T, but that doesn’t mean it changed its approach towards the wireless industry - thus, it’s still a prepaid brand. Today, Cricket announced the upcoming release of Samsung’s Galaxy S5, saying that it will offer it with “the best pricing in prepaid”, namely $539.99 after a $50 mail-in rebate. This seems to be the best Galaxy S5 price in the US, indeed. If you want to buy the handset off-contract from any other carrier, you need to shed at least $599.99 for it. Cricket will start selling the Galaxy S5 this Friday, June 27, both online and in stores. Customers will be able to pair it with Cricket’s monthly plans starting at $35 (after “a $5 credit for using Auto Pay”). The Samsung Galaxy S5 offered by Cricket won’t be different from the version that’s already available in the US, featuring Android 4.4 KitKat, LTE, a quad-core Snapdragon 801 processor, 16MP rear camera, heart rate monitor, fingerprint recognition, and a water-resistant body. At the moment, the Galaxy S5 can be bought in the US via Verizon, AT&T, Sprint, T-Mobile, U.S. Cellular, MetroPCS, Virgin Mobile, and Boost Mobile. 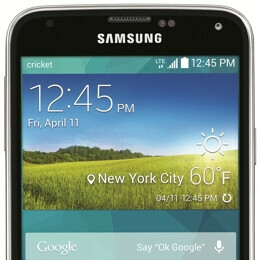 So the ATT logo on the Galaxy S5 must cost $100 if ATT can sell the Galaxy S5 for $100 less without their logo. Some tiny American subsidiary, that no one has heard of, makes the news on phonearena? Cricket now uses AT&T's LTE network. The speeds are capped, but I hardly notice it, and it's only $45 a month for 2.5 GB.